Today in Masonic History Joseph Cilley is born in 1791. Joseph Cilley was an American politician. Cilley was born on January 4th, 1791 in Nottingham, New Hampshire. He was educated at Atkinson Elementary, a school in Atkinson, New Hampshire. The school is the oldest co-educational school in the United States. After attending Atkinson Academy, Cilley enlisted in the war of 1812 as an officer in the 21st Infantry Regiment. He was wounded in the Battle of Lundy's Lane when a musketball caused a compound fracture of his leg. He was brevetted, field promotion, to the rank of captain. In 1817 he was the quartermaster of the New Hampshire Militia. He became the division inspector in 1821. In 1827, after his military service was over, Cilley became Aide-De-camp of Governor Benjamin Pierce. In 1846, Cilley was elected to the United States Senate. This was to finish the term of Levi Woodbury who had been appointed to the United States Supreme Court. Cilley served in the Senate for just under one year when he ran and lost his reelection bid. After returning to New Hampshire, Cilley retired to his farm where he spent the rest of his life. 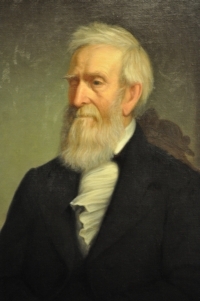 Cilley passed away on September 16th, 1887 at the age of 96. At the time of his passing he was the oldest living United States Senator. Cilley was a member of Sullivan Lodge No. 19 in Lee, New Hampshire. From 1848 to 1849 he was the Deputy Grand Master of the Grand Lodge of New Hampshire.